Syndicate Bank has released a notification for the recruitment of 500 Probationary Officers in Junior Management Grade/Scale-I through One year full-time Post Graduation Diploma in Banking and Finance from Manipal Academy of Higher Education (MAHE). Interested candidates may check the vacancy details and apply online from 02-01-2018 to 17-01-2018. Educational Qualification: Candidates should have passed Graduation Degree with 60% marks or equivalent in any stream from a recognised university. Age Limitation : Minimum 20 years and Maximum 28 years (as on 01-10-2017). General/UR/OBC candidates have to pay Rs. 600 and SC/ST/PWD candidates have to pay Rs. 100 through online mode using Net-banking/Credit or Debit Card/IMPS/Mobile Wallets. 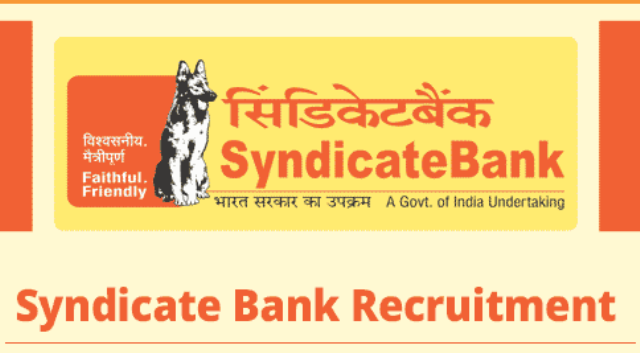 Interested and eligible candidates may apply online through Syndicate Bank website - https://www.syndicatebank.in/ - from 02-01-2018 to 17-01-2018.